The name on the label says “Four Tops” but this is really a Levi Stubbs record. Stubbs was never one of Motown’s marquee vocalists, and the injustice of that act is amplified by his three-minute tour-de-force singing here. Mickey Stevenson and Ivy Hunter’s song and production is more mature than the typical Motown single. Stubbs’ classic soul voice is imbedded with the “hurting pain” he’s imploring his friend to avoid. The female backing vocals sound silly when they introduce the song, but blend well with the arrangement. The other three Tops are all but absent, but they’re not missed thanks to Stubbs’ heart-wrenching performance. My all time favorite Motown song. You have excellent taste, Alex. Thanks for reading. Somewhere in Nelson George’s “Where Did Our Love Go” (St. Martin’s Press, 1985), he calls “Dancing In The Street” William Stevenson’s “most important on-record contribution to Motown.” That’s not untrue, but “Ask The Lonely” deserves to stand right alongside it. When it comes to romantic disillusionment from a male perspective, Stevenson built as perfect a platform for Levi’s personality and style of delivery as “A Fork In The Road” is for Smokey, and “Since I Lost My Baby” was for David. 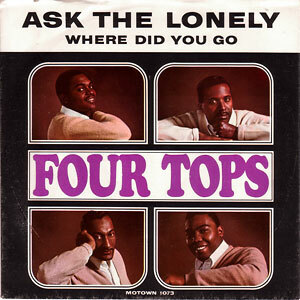 This was the third Tops single for Motown, and if “Baby I Need Your Loving” and “Without The One You Love” hadn’t sealed the message completely, with “Lonely,” Tops fans were now inarguably on alert that each of their 45s yet to come would be records of substantial musical gravity.